Just yesterday, Xiaomi announced that it will launch its next flagship smartphone, the Mi 8 on 31st May at its forthcoming flagship launch event in Shenzhen, China. 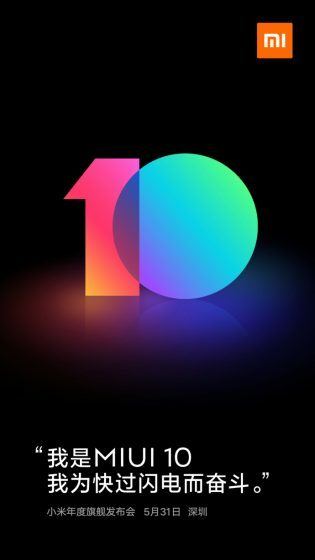 And today, the official MIUI Weibo account confirms that the Mi 8 launch will be accompanied by the unveiling of the company’s next software iteration – MIUI 10 – as well. As seen in the poster attached below, Xiaomi states that MIUI 10 will be faster than lightning. This indicates that the upcoming software update is going to bring along performance optimizations along with new features. MIUI 9, which carried the ‘fast as lightning’ tagline, so MIUI 10 is playing on the same theme. We expect the Mi 8 flagship to be powered by MIUI 10 itself, based on Android 8.1 Oreo. Xiaomi first kicked off the development of MIUI 10 at the beginning of this year, saying that it will utilize AI and machine learning to optimize the user experience (UX) and offer great new features. It has already discontinued work on MIUI 9 to focus on stability, which has already hinted us on the impending arrival of MIUI 10 on Xiaomi devices. As for the name, the Chinese giant had conducted a poll to gain the user perspective on whether they should name it MIUI 10 or MIUI X. But, it finally settled for MIUI 10 and it would be coming to devices running Android 6.0 Marshmallow and higher. All of the devices that won’t receive the update include Redmi Note 2, Redmi 3, Redmi Note 3 (MTK) and Mi Pad 2.